The RapOet, Self Suffice, is a popular host and poetic rap artist (MC), first booked by the legendary Eric Drooker (New Yorker Magazine) and Talib Kweli (#2 Billboard 200). After graduating from Stuyvesant (the most coveted of NYC’s 9 specialized high schools), amidst a growing buzz in Manhattan’s Underground Hip-Hop scene, he was offered a production deal with Def Jam, which he declined in favor of a scholarship to Trinity College. After graduating, he continued to win rap battles, feature on compilations, and serve as a DJ (and Music Director) at WRTC in the heart of the Tri-State area. Wanting to share his success with others, while creating events that exemplify Peace, Love, Unity, and Joy, the RapOet transitioned from battling other MCs (putting them down) to hosting showcases and open mics (lifting them up). His insightful, positive and energetic live shows have been booked by, and featured alongside, the most inspiring wordsmiths of our time, from Talib Kweli to KRS-ONE; from Jessica Care Moore to Alice Walker. 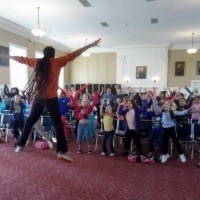 Besides “wowing” crowds with both Rap and Spoken Word lyrics (hence the name “RapOet”), he developed the popular RapOetry Workshop to teach Positive Self-Expression (in parks, libraries, and cultural centers), as well as enrich Math, English and other curricula (for middle schools, high schools, and colleges). When not performing, hosting, or leading workshops, Self Suffice collaborates with other inspiring artists. His latest collaboration with Mez (J Cole/Roc Nation), entitled “Manhattan Night” has received critical acclaim ranging from RapReviews and MTV, to the Examiner and NPR. The first single hit #3 on the Top 40 Independent Hip-Hop Chart. The Download is available now on iTunes, Amazon, & Spotify. The CD is available at ReverbNation, rapOets.com, & at live shows!